I’ll be honest with you; I never put much thought into the surf leashes I buy. I usually just get whatever is the cheapest or anything that is on sale. Growing up in California I’ve learned that most any surf leash of any type will do just fine in California surf. In Hawaii however, choosing the right surf leash is pretty important. I have snapped a few leashes in Hawaii, and its never fun to be stuck out in heavy surf without a board to float on. In Hawaii I currently use a 6-foot comp leash that works great most days. The one problem is that on bigger days the leash gets so stretched when I fall that sometimes it flings the board back at me really hard. If it ever hits me it could really do some damage to the board and my face. For my new board that I purchased for the summer in California I got a 6-foot comp leash by Blackline Manufacturing called “The Rover”. I surfed some pretty solid waves at Cotton’s Point, Lower Trestles and Salt Creek with it and surprisingly it didn’t stretch nearly as much as my other leash does. It feels really comfortable around my ankle and so far I haven’t noticed anything that really bothers me about the leash. I have actually gotten my feet tangled up in it on the take-off several times surprisingly, something that never happens to me. I can’t say it’s the leashes fault for sure, but maybe it is a little stiff and doesn’t get pulled straight in the water when I paddle into a wave. Either way, I still think it is a great leash for the California surf. We’ll see how it holds up if I still have it next winter on the North Shore. 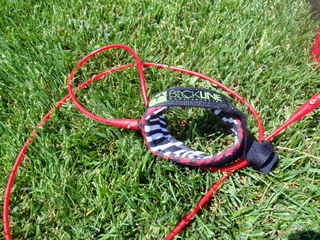 “The Rover” is easy to find at surf shops and online, and costs around $20, which is a decent price for any surf leash.